As I begin to write this article, I find myself pressed for enough time to write this and still make it to a meeting I have this evening with a planning committee. We are putting together a program to celebrate the 100th birthday of our local Confederate memorial, which was a statue of a soldier placed on our town square a century ago by the local Daughters of the Confederacy. The statue is not really there to memorialize the war itself but rather, to honor the service of the nearly 900 local soldiers from my home county who elected to go and fight the Union Army. Ironically, today is also the 150th anniversary of the beginning of that war which began with the firing on Fort Sumter in South Carolina. The bold statement made by The American, a newspaper of the time, tells a story of the convictions of both sides, convictions that were as hard as the steel bayonets they would later use to run through their enemies in the name of their country. At first, I didn’t want to write about this. Even today, a century and a half later, it is a war steeped in controversy with a strong undercurrent of simmering bitterness for many people who still debate the reasons, the merits of one argument over another and the moral issues that defined generations after it happened….but the more I thought about it, the more I had to ask myself…how could I, a native Southerner who aspires to craft words, not write something about it? How could I not throw my hat into a ring that is about to see an influx of hats in the weeks, months and years ahead? You see, today was a major anniversary and over the next four years, there are going to be a lot of major anniversaries, each one associated with this episode of internal struggle that happened on our nation’s soil and each anniversary is a plump peach, ready to be picked, examined, cut open, tasted, judged and found to be wonderful by some and distasteful by others. Every epic battle, every small but key skirmish, every event of importance, every major victory and defeat will have their own special sesquicentennial day to look back and remember the past. 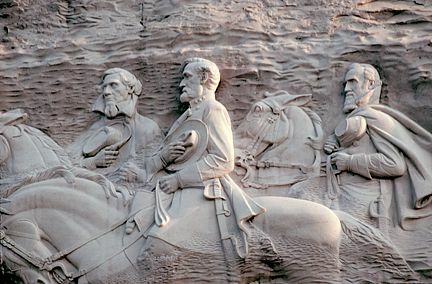 In July of this year, it will be Bull Run….in 2012, Shiloh…in 2013, Gettysburg and the Gettysburg Address…and of course, in 2014, Atlanta and the March to the Sea will be remembered and analyzed in detail. Finally, in 2015, the 150th anniversary of the end of the Civil War with the surrender of the Confederacy….and there will be a lot events in between because those I mentioned just barely scratch the surface. It was bloodiest war in our nation’s history. Over 620,000 men, most of them young, died on the battlefield. Many more civilians, including women and children, perished as a result of the effects of the war and both sides, north and south, were scarred from the horrors they saw. These facts above all should be remembered. The majority of an entire generation of men were lost and many more were damaged for the rest of their lives, either physically or psychologically. Let us make sure we don’t forget these facts. Let us also remember that as black and white as this particular war seemed, it was anything but that. Not every Southerner was a Confederate, nor was every Northerner a Unionist. Not every Southerner owned slaves; in fact, only a fairly small percentage did and the rest didn’t. Those that didn’t weren’t going to lay down their lives for an institution that didn’t affect them. They fought for their right of self-determination and freedom from what they perceived as tyranny from a part of their own country that back then, was as far removed from them as China is from us today. Slavery was a terrible institution that has scarred generations of Americans but it wasn’t the reason for the Civil War. The politics of the time had divided the country into two sides, each one convinced they were right and each side intractable in their beliefs. If that sounds familiar, it should be. The politics of our time has done the same thing today and you have a divided country, the red states and the blue states, each one believing with absolute certainty in the rightness of their cause. The slaves were victims no matter what they did-either victims of slavery itself or those who wanted to exploit their plight for political gain and while the north freed them of their servitude, they did little else to help them after the fact. They did not educate them, they did work to integrate them into mainstream society or anything else for that matter. To say that this war was not fraught with moral and ethical issues would be a gross misstatement of the truth. Many Americans acknowledge this truth today though. Many Northerners did not believe in their cause either. They respected the South’s discretion to decide for themselves whether to be part of the Union or separate from it and they disagreed with the North’s decision to reunite the nation by use of deadly force. Many Northerners fought for the South and many Southerners fought for the North. Whole families were divided about these issues and many were never reconciled. People fought for all kinds of things; freedoms and their lands; reuniting a country; setting men free and yes, in some cases, keeping them. The war itself cost billions of dollars in today’s money, destroyed billions of dollars in property, decimated one group of people and cast another group out into a world for which they were completely unprepared for. Like an earthquake, which relieves tremendous pressure in the movement of the earth’s plates, the war was the inevitable result of pressure that had built it up for a long time and had to be released and like the earthquake, it left things broken, unfinished and unresolved even to this day. The simplest equation in this entire period though was the soldier, who did his duty and did it for what he believed was the right thing to do. He walked for hundreds of miles with poor food and little to lift his spirits. He would defend, to the last ounce of his strength, his homeland, be it South or North, against anyone he thought had come to do it harm. He sacrificed his health, and often, gave his life for his own personal convictions, not just a common cause. These are the people who were the history that we celebrate, commemorate, and honor today, both North and South and will continue to honor over the next few years. These are the ones we must not lose sight of or forget….and, if we have truly evolved as a people, maybe we will learn a few lessons as we look back over these next four years and try to make sure that the pressure doesn’t reach a point that it nearly consumes us once again. We view history as if through a myopic telescope, where the images are sometimes distorted and unclear and if we use a telescope to look back at where we are, its like through the large end of it where what we see from this end now looks very small and very distant to us. Its easy to draw our own conclusions about our history but not very easy to accept truths about it sometimes….yet our history is as much a part of who we are as our own eyes are and we cannot truly appreciate it until we understand that we are a part of it and that it is a part of us.